After spending three days in Lugano, I got into the Land Rover and set Geneva as the destination on my Garmin GPS. Once I started to drive, I noticed the navigator taking me there via Italy and France. I was a bit puzzled, but followed the route nevertheless, and sure enough, it got me to Geneva, back in Switzerland. When I arrived at my destination, I mentioned to my friends about the route I took and was informed that not only was this the best route, it was also the fastest! It was a long drive, and I arrived at the Bahrain Embassy in Geneva about 15 minutes later than scheduled. Nevertheless the Ambassador, H.E. Abdulla Abdul Latif and members of the embassy were waiting for me and gave me a warm welcome. We spoke about the journey and the adventures along the way, after which we drove first to the lakefront and then to the old section of Geneva where I took some pictures. Among these was a very attractive Russian Orthodox church. 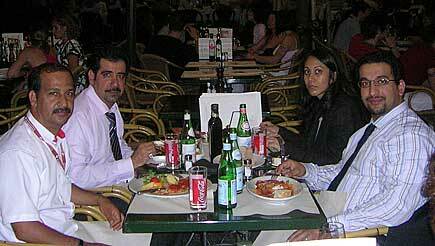 Later that evening, Mona Radhi from the embassy's press office joined us for dinner which lasted until 11pm. I am very grateful to our ambassador and members of the embassy for being so gracious with their time and hospitality during my stay in Geneva. All told, my Swiss stopover showcased was a beautiful country this is to visit - well worth it for a peaceful and relaxing holiday in idyllic surroundings. From Geneva, I drove to the French border where I booked into a motel for a good night's sleep before heading to Paris.